Watercolor wreath of coral Magnolia flowers; spray included. These delicate Magnolia blooms in shades of coral are hand painted in watercolors. The blooms have been fashioned into a dainty clip art wreath, with a branch background. 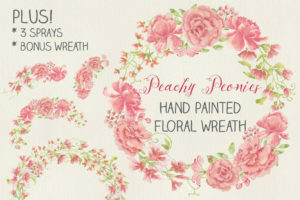 The wreath is ideal for wedding stationery, scrapbooking, decoupage, labels and logos. The listing includes a matching bouquet in coral shades. Create co-ordinated stationery and other items with this clip art. Treat yourself to a preview of the floral artwork by downloading a posie in the same flowers, absolutely free! The Freebie posie is available here. The bouquet measures 8 inches X 5 inches (2400 X 1500 pixels). The Freebie posie measures 7 inches X 7 inches (2100 X 2100 pixels). 1 zipped folder is immediately available for download following purchase containing the wreath, the bouquet and the Freebie posie files (JPEG and PNG) – 6 files in total.